WILD MOTH and IRON PIER (Self Defense Family, Weed Hounds) are excited to announce the upcoming release of INHIBITOR, the sophomore LP from the California outfit. Scheduled for a May 26, 2015 release on vinyl and digital formats, Inhibitor is the follow-up to Wild Moth’s 2013 debut full-length on Asian Man, Over, Again, as well as a recent split 7″ (Broke Hatre) with fellow Bay Area post-punks Creative Adult. 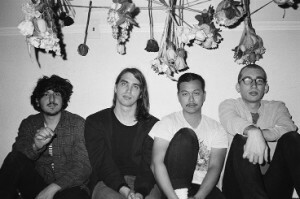 Inhibitor was recorded at Atomic Gardens with Jack Shirley (Deafheaven, Joyce Manor, Whirr) and Max Senna (Miserable) at Secret Bathroom Studios, and it finds Wild Moth hitting a new gear. Layering sludgy, darkly textured guitars on top of each other, the band pulls the listener along on an even stronger melodic underpinning than previous releases. SF Weekly cited Wild Moth as “one of the Bay Area’s most promising young post-punk bands” while Impose Magazine called its recent split “a slowed down power trudge, perpetually layering sounds on top of one another, and building in sonic momentum.” Think modern shoegaze that mixes spikes of punk-infused energy, akin to Isn’t Anything-era My Bloody Valentine crossed with Drive Like Jehu. In late March, Wild Moth will headline a tour of California and Arizona with new label mates and recent Iron Pier signings Hollow Sunshine. The outfit will hit the road again in mid-April supporting Whirr across the Southwest and California. Dates are below. If you’d like to attend a show or speak with the band, drop me a line here. To be notified when pre-orders for Inhibitor launch, sign up here. Stay tuned for more Wild Moth news and song premieres from the LP in the coming months. You can follow the band on Facebook. Follow Iron Pier on Facebook and Twitter as well.